Exhibitionism R Us. Let's pee out the window! Or let everyone watch? 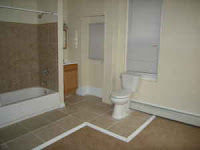 Yes indeed, the toilet is in the space formerly known as the "second floor back bedroom." Haven't these people ever heard of this nifty new technological marvel called a "wall" ? Your prize, dearest Dr. Hey There Matron, for successfuly answering this question is.....you can choose whether to pee out the window or out the back door. Or on the bedroom floor. Hey there in Adjunctville! I called her Dean yesterday and asked if I could take a 'leadership' role in cleaning & organizing the adjunct office, serving as a point person for them, and starting a conversation about how the culture might change at the college. There was a hearty yes! Then!! Then I learned how many adjuncts shared an office with four desks, a file cabinet and three computers. 50!!!! Oh my God. Criminal. Hope you manage to get done what you need to! I know it's ugly. . . .